Texas Railroad Commissioner Ryan Sitton of Friendswood, left, receives compliments on his speech at the Economic Alliance conference from San Jacinto College Chancellor Dr. Brenda Hellyer and Deer Park Councilman Tommy Ginn. 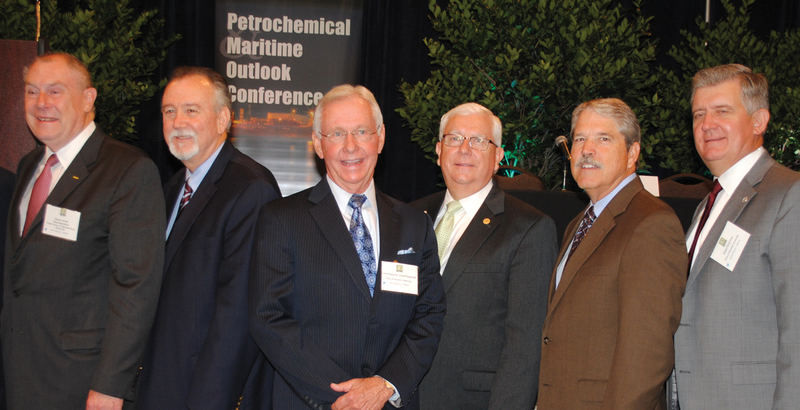 An all-star lineup of speakers greeted the crowd of about 700 attending the 2015 Petrochemical & Maritime Outlook Conference, hosted by the Economic Alliance Houston Port Region at the Pasadena Convention Center. Starting with the welcome by Pasadena Mayor Johnny Isbell and the Pledge of Allegiance by Harris County Sheriff Ron Hickman, the lineup included area Congressmen Gene Green and Dr. Brian Babin and continued with Texas Railroad Commissioner Ryan Sitton and Port of Houston Executive Director Roger Guenther. Some of the other luminaries playing a role in the Aug. 27 conference included Chevron Phillips Chemicals Plant Manager Mitch Krutilek, BASF Senior Vice President Chris Witte, Dow Plant Manager Monty Heins, Shell Deer Park General Manager Barry Klein, Kinder Morgan Terminals Vice President Mathew T. Tobin and Dr. Loren C. Scott, president of Loren C. Scott and Associates. Which way do we turn? That was the question as, from left, State Rep. Wayne Smith of Baytown, Port Commissioners Stephen Don Carlos of Baytown, Clyde Fitzgerald of Pasadena and John Kennedy of Nassau Bay line up with State Senator Larry Taylor and Port Executive Director Roger Guenther for photographers during a break at the Petrochemical & Maritime Outlook Conference. Petrochemical, maritime and logistics experts all delivered bold forecasts for continued capital investment in new facilities and expansions in the Houston Ship Channel and Greater Houston region. While it was clear that declining oil prices and resulting job cuts were on the minds of industry leaders, they expressed confidence the “downstream” industry was well-positioned to grow and could adjust to a changing market due to cost constraints implemented by refining, chemical and maritime industries during the 2008-2009 recession. All see challenges ahead, especially the petrochemical and maritime industries, which are experiencing a growing gap of skilled workers needed to build, maintain and operate plant and port facilities and are working with area community colleges and high schools in an effort to expand the pool of qualified workers. 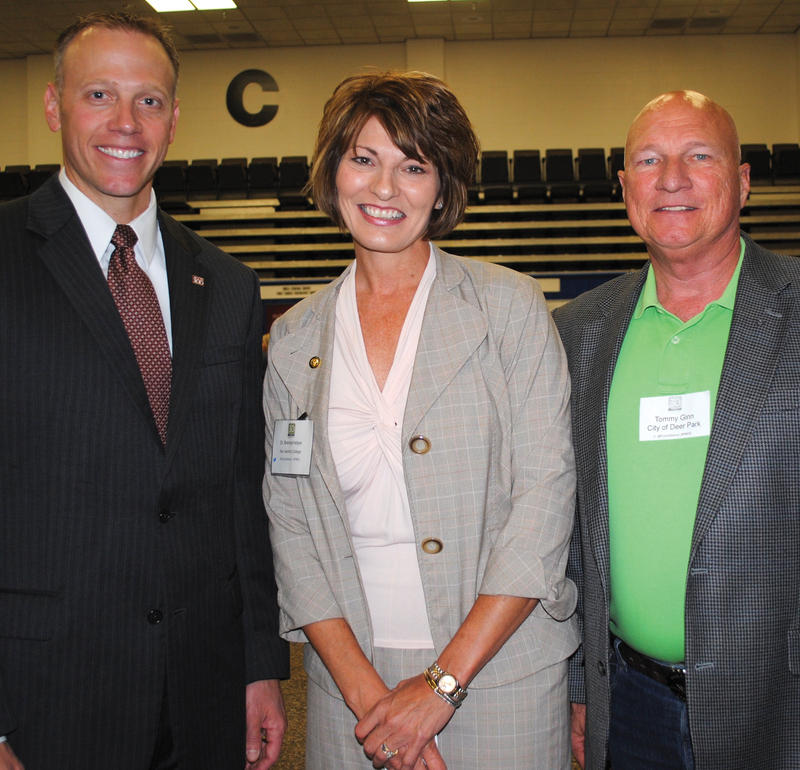 Michelle Hundley, Economic Alliance public affairs vice president, welcomes Congressmen Brian Babin, center, and Gene Green to the annual conference at the Pasadena Convention Center. Lee College and San Jacinto College have expanded their training programs for petrochemical careers and San Jac is nearing completion of a new maritime training center on the Houston Ship Channel to boost maritime training. Congressman Gene Green (D-29) expressed optimism that the EPA would continue current programs that have seen improvement in air quality rather than burdening industry with new, costly regulations. 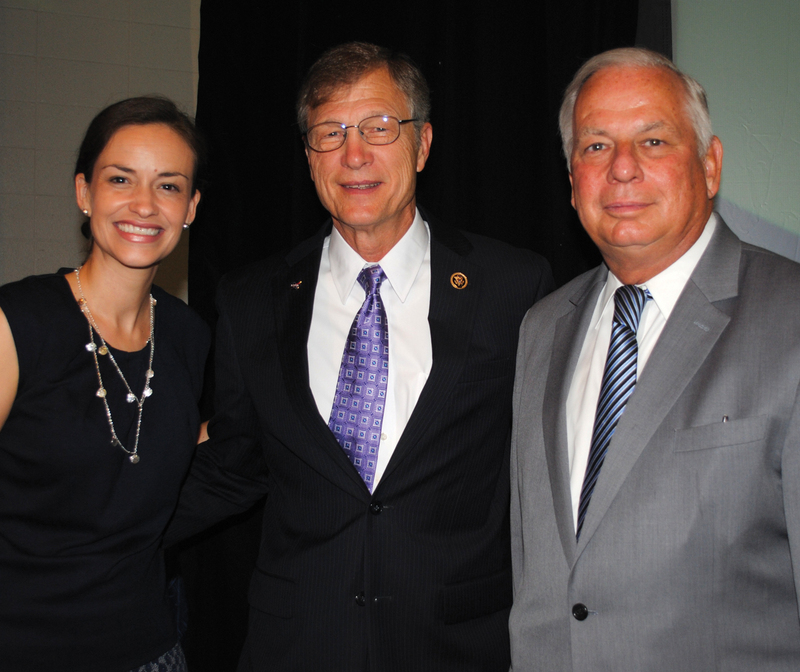 Congressman Brian Babin (R-36) acknowledged that Congress is prepared to pass legislation that protects the public and industry in a cost-effective manner. The Port of Houston Authority was the presenting sponsor of the conference and LyondellBasell, Lee College, San Jacinto College and Bay Group Media were gold sponsors. More than 40 companies were silver and bronze sponsors.